Photographer Phil Stern, who turned 95 this week, has donated prints of 95 of his iconic shots to the Veterans Home of California, where he is currently a resident, reports Media Bistro. A special celebration and unveiling of the donated prints is scheduled for this weekend. Marilyn is pictured here at a backstage at a children’s benefit at the Shrine Auditorium in 1953. In another, most pensive photo, she poses with Jack Benny. They had filmed a hilarious sketch for his television show at the same venue in September. 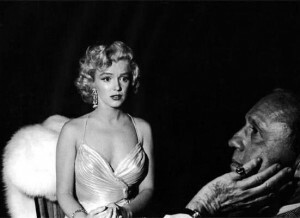 Although Marilyn’s expression looks tragic, the photograph may have been staged to present two comedic stars in a different mood.